There is an ongoing debate across Canada and the USA about the alleged merit of adding fluoride to municipal drinking water. Most Western European nations have discontinued the practice of adding fluoride to municipal drinking water for a variety of reasons, one of them being that the state has no right to forcibly medicate its citizens. While anti-fluoride forces across Quebec and British Columbia have been very successful at persuading municipalities to discontinue the addition of fluoride to municipal drinking water, the medical establishment in Ontario along with Health Canada actively lobbies for continued water fluoridation. In late 2013 and early 2014, several communities near Toronto voted to discontinue water fluoridation, including a municipality where the mayor was a dentist who doubted the effectiveness of the practice. Fluoride opponents point out that the rate of tooth cavities among young children is no higher in Vancouver, which is fluoride free, than in Toronto, which adds fluoride. A medical health officer located in a municipality near Toronto has chosen to disregard a democratic vote by a municipal council to end municipal water fluoridation in response to public opposition to the practice. The medical health officer who is on the public payroll is alleged to have written to the provincial government to mandate compulsory water fluoridation of all municipal water across Ontario, essentially seeking to use the authority of the provincial government to override the democratic votes of elected municipal officials responding to public opposition to the practice. A regime of government control of socialized medicine has created positions of power and authority for medical personnel, positions of power and authority that would not exist in a regime of private medical care. There are numerous examples of medical personnel seeking to exercise greater power and authority by encouraging the practice of forcible medication of citizens. In the USA, teenage girls who live the States of Texas and California are subject to compulsory HPV vaccinations to allegedly inoculate them against certain strains of sexually transmitted diseases. Medical personnel in such jurisdictions now have the authority to medicate children without parental consent and without even advising parents of their children having being medicated at school. Parents who oppose compulsory state medication of their children risk having state authorities take custody of those children. A recent debate in the State of Vermont involved a physician on the public payroll lobbying the authorities to enforce compulsory vaccination for adults and to disregard any freedom of choice through nullifying the conscientious objection clause in state law. While the initiative had supporters in the state legislature, there was enough elected opposition to veto the proposal that would have resulted in otherwise peaceful citizens being sent to jail for refusing compulsory vaccinations. People who oppose such compulsory medical practices advise that the single largest lobby group in Washington represents the pharmaceutical industry, which manufactures medications. The pharmaceutical lobby is believed to operate with an annual estimated budget of US$3 billion, to lobby elected and non-elected officials in the interests of their industry. Such a lobby with such a budget could only be possible in a regime of socialized medicine where government covers the costs of compulsory medication, using revenue that citizens are required to provide through force of law. A regime of state medicine provides a safe and secure market for the pharmaceutical industry. In a regime of private medicine where government is neutral, the pharmaceutical industry would need to develop a very different business strategy. It is under a regime of socialized medicine where government covers a large portion of the costs of health case that the pharmaceutical industry has earned more income, which it has been able to use to expand its influence. 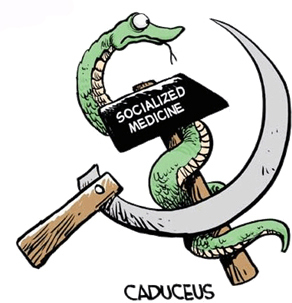 That influence has grown to a level where it would be very difficult for any market-friendly elected official to attempt to dismantle the regime of socialized medicine. During an earlier time when medical care was either private or run by charities, companies that produced medicines represented the tail while the paying private customers represented the dog. Back then the dog wagged the tail. Under the modern regime of socialized medicine, the dog represents the pharmaceutical industry and the tail represents the government. The medical health officer near Toronto, who has approached the Ontario government to mandate compulsory water fluoridation across that province, evidently understands the contemporary dog/tail analogy. Otherwise, why bother to approach the provincial government to disregard the democratic vote of multiple elected municipal councils across Ontario? Only in a regime of socialized medicine could a medical practitioner who is on the public payroll dare show such contempt for the democratic process.